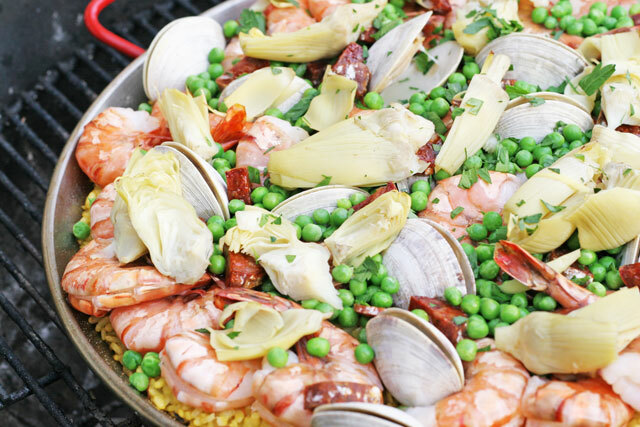 Enjoy your family and friends this summer and make them a paella :). Throw a BBQ, a small gathering, eat outside, enjoy and be grateful for all we have! Summer is still in full effect and I will get every ounce out of it! I’ve been sneaking in more and more summer bounty into my foods, as it will be gone before we know it, so might as well take advantage of it all. I grew up eating Paella, as my family is from Spain. We did all grow up in Mexico, by way of Spain. It is my Mamas favorite dish, she and my brother just moved here from California, so I thought what better way to celebrate my family being here, than a traditional outdoor Paella? 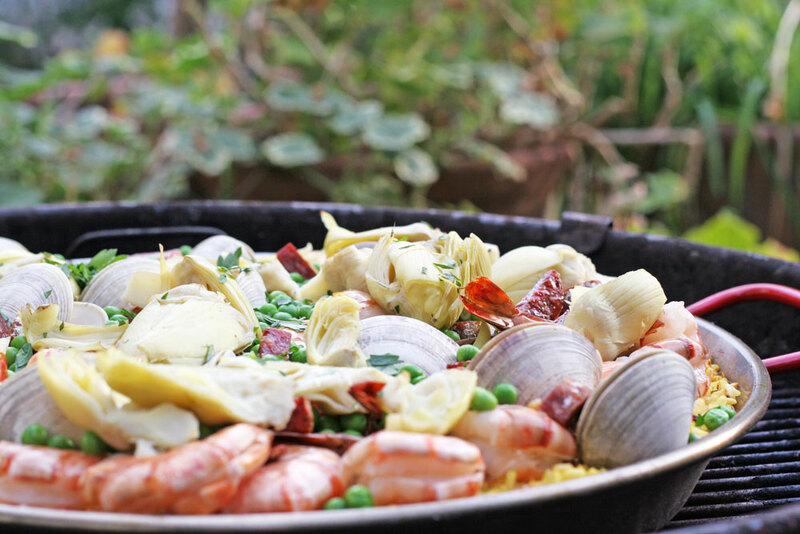 Paella is typically cooked over an open flame outdoors, so that is exactly what I did. I have cooked it many times on the stove, or on our gas grill. But it is perfect when cooked over a very hot flame. The point of a Paella, is a quick family style meal. Many times and most traditionally in Spain, you eat it right out of the pan with crunchy bread. True family style. It does not take long to prepare at all. The coveted MUST is the crusty rice bottom called the Soccarat, which means “to singe”. The key to this crust, is once you pour the liquid in over the rice, YOU DO NOT TOUCH IT EVER AGAIN, LEAVE IT ALONE. 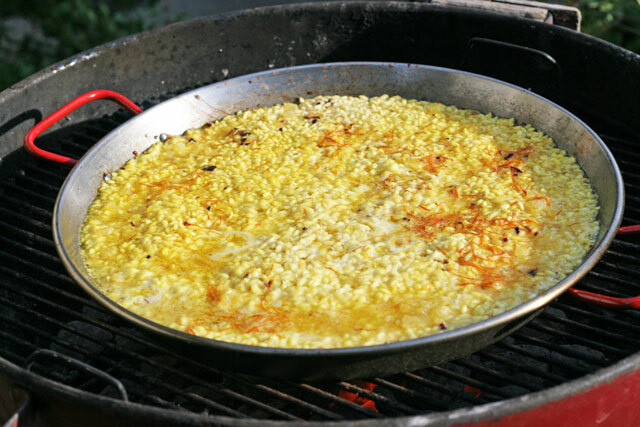 I emphasize this because it is the only way a paella may be cooked for it to be a true paella. That crust classifies it as a Paella, and it is so delicious. It has a nutty rice flavor that is irreplaceable, otherwise, it’s just rice with stuff. 1 cup water set aside for soaking saffron- Let soak for at least 1 hour, confession I let mine sit for a few hours. 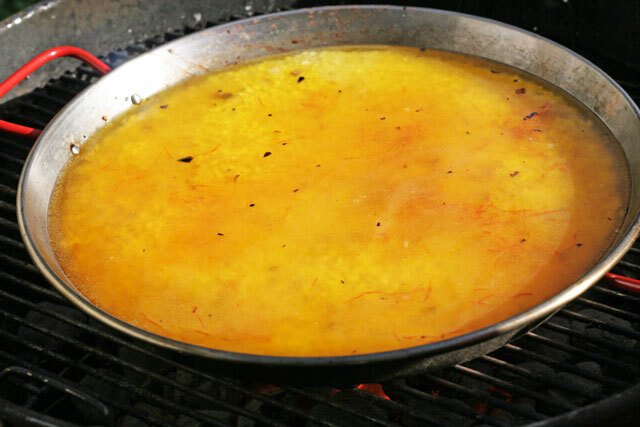 Get your bbq very hot, let the charcoal get smoky white and fire red before you start cooking the Paella. 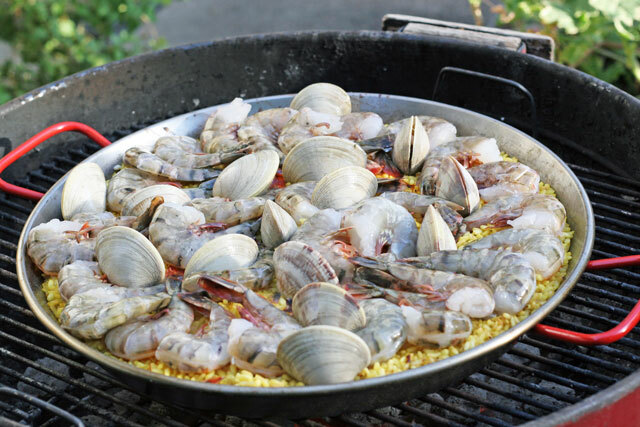 If you are using a gas grill, get it hot around 500 degrees, then start cooking the Paella. If you are cooking it stove top, keep the heat on high the entire time, it will give the crust/socarrat you want. NOTE: Have all of your ingredients ready/mise en place. This is a quick cook, so you want it all handy and ready to go. 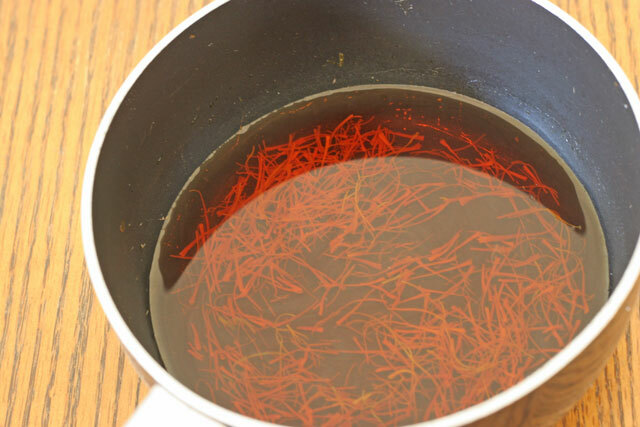 Bring the cup of water to a boil, take off heat, add the saffron. Let soak for at least 1 hour, confession I let mine sit for a few hours. Once the fire is hot, add the oil to the pan. Once it shimmers, add the onion. Saute adding some color for 2 minutes, then add the rice. 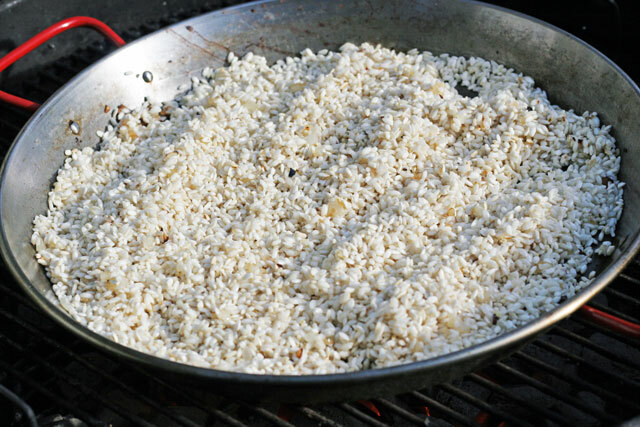 Toast the rice for 4-5 minutes. Add the saffron water (threads included) to the chicken stock, then pour it over the rice. Sprinkle the salt on the rice and liquid. DO NOT STIR/TOUCH/SHAKE/MOVE. LEAVE IT ALONE! Once the liquid is absorbed, it takes about 15-20 minutes, add the shrimp and clams. Cover the grill/bbq/pan. Cook for 8 minutes or until the clams are open. The shrimp should be a light pink when done. Discard any clams that do not open. Add the peas and artichokes, warm up for a few minutes. Removes from heat, place at the center of the table and serve using a large spoon to scoop the crust from the bottom of the pan. Serve with parsley and lemon. I take advantage of the grill/bbq and toast the bread over the open flame and serve warm. Easy – I would make this Paella recipe – looks delicious! I’d make tilapia. I love paella, by the way. My family is from Spain. I would make this delicious paella! And, maybe some lobster rolls. Never too much seafood! Awesome! Mmm, lobster rolls would be a great accompaniment. I would make sushi! Love wholefoods sushi grade ahi! I would also make some amazing sauces to go with it as well! Oooo what a great idea! I would make a delicious risotto! i would love to make chicken veggie soup! I would make a really nice pasta primevera using all the end of summer veggies! Great idea, I may just have to make one too! I love it, I’m into spinach right now. I’ll put it on everything. I’m going to a Paella party on Sunday!! I’d use the card to whip up a few chocolate desserts for a girls’ night. That is so cool! Chocolate anything and girls night, perfect. i’ll celebrate the end of summer with Rosemary-Fig Chicken with Port. love whole foods produce! Great idea! I’m obsessed with figs. I’d make spiced salmon with Indian basmati rice. Penne with roasted red peppers, carrots, fennel, garlic, and red onion. I’d like to make an organic veggie lasagna – fall oriented! with roasted peppers, roasted squash, farm tomatoes, eggplant, lots of cheeses with tomato and bechemel sauce. I make my own whole grain pasta sheets. A day’s work, but worth it! The selection of veggies and fruits are amazing at Whole Foods! I’d love to make grilled salmon and veggies! Good Call, I love Salmon! Thanks! Mmmm what a good choice. I would like to make turkey chili. I have the best black bean turkey chili on my site. I love making it with cornbread! I would love to make Pad Thai noodles with tofu! Thanks for the giveaway and recipes. I have been craving noodles!